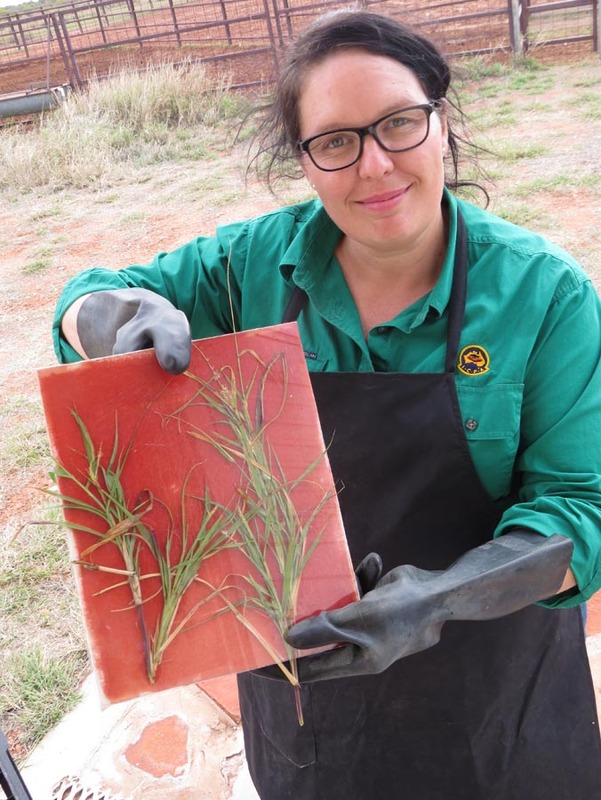 Amee with a solar print of grasses on calico in process. Rusted tablecloth on the catwalk! Amy's vision for the rusty tablecloths was spot on! Here they are, all three tablecloths. Perfect with Amee's stunning paper jewellery creations. Now far from the catwalk... Deb continues to experiment, dyeing paper with various natural dyes. Rusted Cloth bound book, with dyed string and paper beads. The rusted book open. I utilised a small piece of rusted paper destined for the bin to make this tiny treasure. Three Hills: Spinifex on Spinifex paper: Acrylic ink and pastel. Portrait of Peter Severin: pigment and pastel on 9 x A4 sheets of Curtin Springs handmade paper. Hung in the Portrait of a Senior Territorian 2017. Rust pattern near the Paper Mill. The sound of rain,...water running over cracked soil...Hurray! Trees reflected in the dam after rain. Eagles nest in dead treas. Pacific Heron at the dam. Thorny Devil, saved form the road and released. I have been working with Curtin Springs Paper since late 2015, it featured largely in my 2016 exhibition FLORA; The Alchemy of Playing with Plants. Taking up my post as Artist in Residence in November 2017 I looked forward to the opportunity to carry out some exciting new experiments with Curtin Springs paper. I am practiced at the process of natural dyeing and eco printing on silk and wool but I was keen to see what results I would get on the hand made paper. So I set up a little studio/lab under cover, outdoors, where I could safely boil up natural dyes and eucalyptus leaves on a camp stove. These were then applied to the hand made paper, using steam and clamps. The results were fascinating though not always what I had hoped for. So being first and foremost a ‘plein air’ practitioner I turned my attention back to drawing. It was very hot however, being November, not a comfortable time in the landscape, so I rose early to beat the heat and flies, drawing upon the beautiful dawn landscape using pastel pencils (Pitt Pencils) on spinifex paper. The big skies always delight me at Curtin Springs and we were blessed with some spectacular storms. So I worked each day on drawings of Mt Connor and the so-called ’Halfway Tree’, a singular Desert Oak of magnificent proportions and significance. With tourism being such an important part of the Curtin Springs oeuvre I played with the notions of postcards and personal narrative, developing a couple of concertina books using handmade paper, that bear reference to old fashioned fold-out post cards from my childhood. I plan to develop more of these. As always I took lots of photos and reveled in the good creative company at Curtin Springs. I worked with Amee helping her develop concepts for textiles and clothing for her entry in Eco Fashion Week in Perth, it was fun! Amee is a courageous creative and it’s always a pleasure to work along side her. Congratulations Amee on your success at Australia’s first ever Eco Fashion Week. Well done!